Audrey Johnson as Anne Elliot in “Persuasion” at the Wellstone Center, June 15-18. Photo by Anna Stauber. Aethem Theatre Company’s world premiere adaptation of Jane Austen’s Persuasion, June 15-18, is a superbly acted delight. 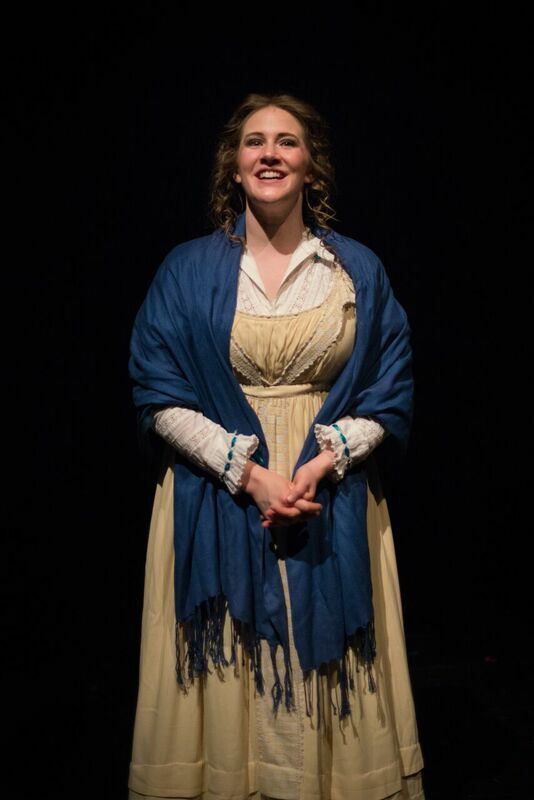 The company’s founding member Kayla Hambek has accomplished a nearly herculean task in adapting the book to stage given that much of Austen’s exposition is the protagonist’s inner monologue. Hambek cleverly uses Anne Elliot’s (Audrey Johnson) diary-like conversations with her dead mother as a way around this. She also adds in dance and movement to lighten the mood and break up the often dense-to-modern-ears, Regency-era dialogue. Johnson gives a natural and heartfelt performance as the heroine Anne Elliot. Supporting actors bring to life Austen’s wit and sharp eye to eccentricities: in particular, Kayla Dvorak Feld as the neurotic Mary Musgrove, John Goodrich as Anne’s vain and clueless father, Sir Walter Elliot, and Jamie Jachimiec as the simpering Mrs.Clay. Chelsey Grant gives verve and energy to her character, Louisa Musgrove, and is a graduate of the Bloomington Jefferson High School theater program that produced Ivey Award winner Tyler Michaels. Austen’s final novel follows the love story of pragmatic Anne Elliot and passionate Captain John Wentworth (Daniel Vinitsky). Eight years after their broken engagement, Anne and Wentworth are thrown together again, their situations reversed – he is wealthy, and her family is struggling to pay their debts. Anne has superior character and intellect but suffers as the dutiful daughter and sister to her vain and superficial family members. She was persuaded by her mother’s confidante, Lady Russell (Gina Sauer) to break the earlier engagement but now must decide on her own what her future might be with Wentworth. She faces the push and pull of familial duty, a scheming suitor and class bigotry while coming into her own as an independently thinking woman. Jane Austen fans and newcomers to her work will enjoy this play. My only criticisms are that a backdrop would have added to the play’s visual impact and the dance sequence in the second act was too modern and out of place. That said, it never ceases to amaze me the level and breadth of theatrical talent we enjoy in the Twin Cities. The acting was on par with many of the productions I’ve seen in larger companies. Props to Hambek for tackling this complex play and production. Persuasion, based on the novel by Jane Austen. Adapted by Kayla Hambek, directed by Calli Kunz. June 15-18, all shows 7 pm; Sunday at 2 pm. Tickets $18 at http://persuasion.brownpapertickets.com or $20 at the door. Showing at the Wellstone Center (View), 179 Robie St East, St Paul. More information at aethemtc.com.